A comment by Petronius in this entry brought to my attention the works of Rafał Olbiński. I know some of us enjoy not only stories and collages about giantesses and shrunken men, but other types of media as well. For my part I love books, and I love art; and I combine those and collect art books when I get the chance to do so. 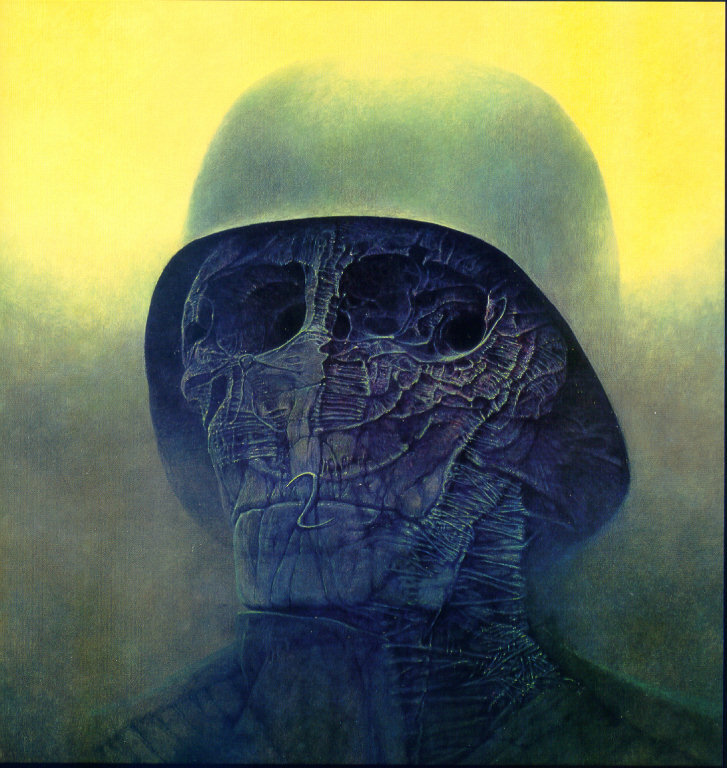 I was a little surprised to never have heard of Rafał Olbiński, especially when… well, look at these images! La Dolce Vita – I wish I could tell you the reason behind the creation of this poster, because on one hand there’s Nino Rota, who wrote the music for the Fellini film with the same title, but on the other hand Krzesimir Dębski, a classical music composer, also has his name on the poster. 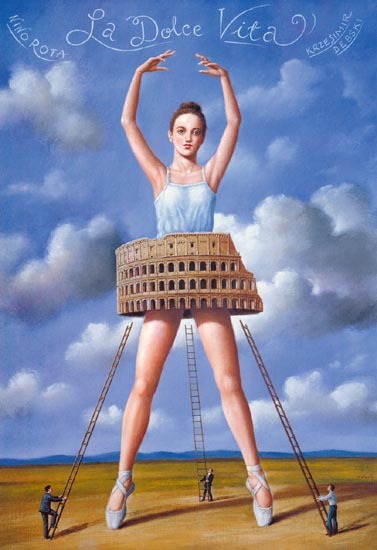 There’s no mention of a Dolce Vita ballet on the Internet or on a list of his works, so I’m just going to concentrate on the fact that there’s a giant ballerina wearing a coliseum as part of her dancing attire, and three men are carrying ladders in her direction. That blue sky (actually the style of the whole painting) reminds me of Magritte’s work, sans the apples and the faceless. La Traviata – Was the first opera I ever went to listen live. I love the opera. I sit here thinking of it, and my heart pounds. This poster was created for the New York City Opera performance of Verdi’s La Traviata in 1992. 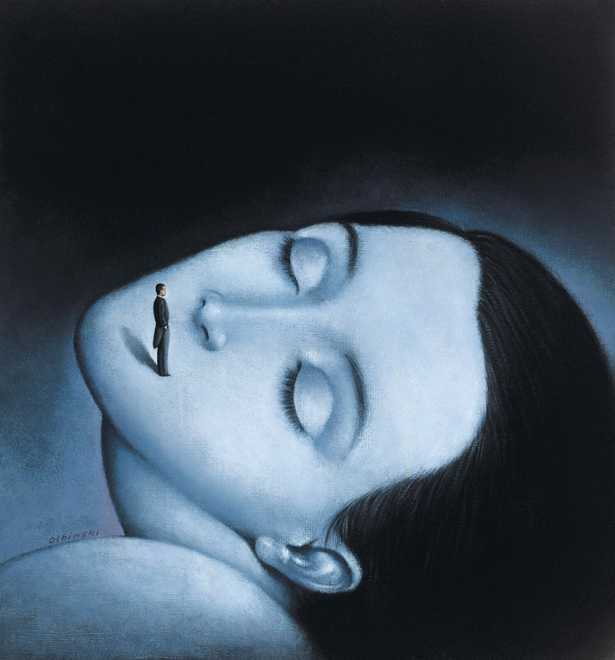 Considering Violetta’s fate, it’s interesting to see her portrayed as larger than life, with whom I assume is Alfredo taking the place of her mouth. Madama Butterfly – Another magnificent opera I have had the bitter pleasure of seeing live. 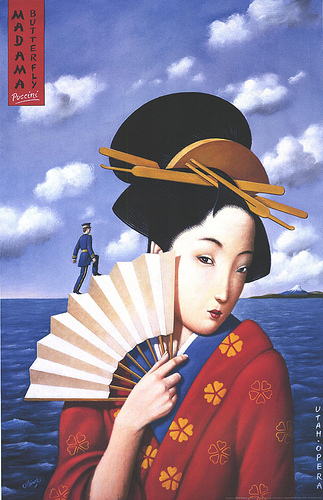 The poster was created for the Utah Opera 2000’s performance of Madama Butterfly. If only she were that size, then Pinkerton would have some sense of regret for his cruel actions. He would most likely feel this sense of regret between his legs, from what used to be there. It’s also possible that a giantess Butterfly would have rearranged Pinkerton’s face instead of killing herself and allowing another woman to raise her child. The Tales of Hoffman – An opera by Jacques Offenbach based on three short stories by E.T.A. 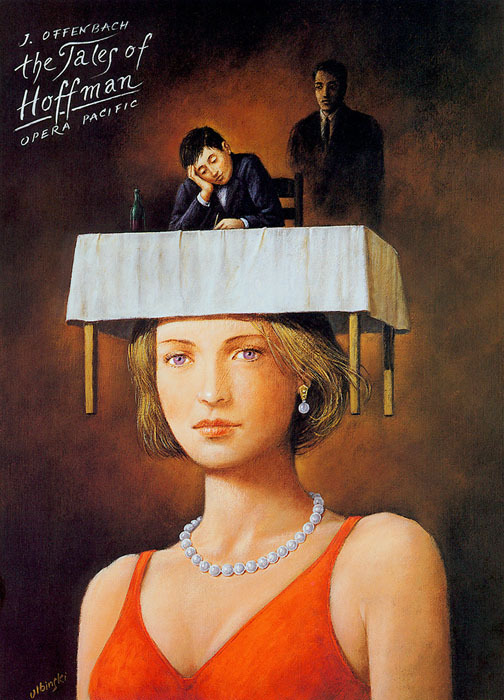 Hoffman, and the poster was created for the Opera Pacific, which doesn’t seem to exist anymore. I’ll skip my rants on why that might be, avoid an enraged diatribe about the state of music in this economy, and instead mention that this is a lovely poster. It reminds me of Kinuko Y. Craft‘s illustrations, although not as exuberant. 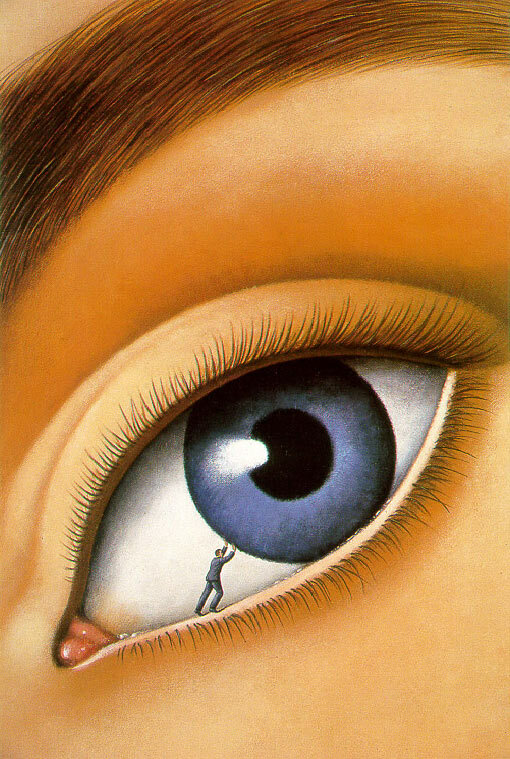 Innocence of Courteous Intentions – A painting and not a poster. It makes me think of the Clash of the Titans movie, in which gods can see the little mortals through some sort of mirror or glass on a table. I can’t remember it well because I haven’t seen it in so long, but I bet you know what I’m talking about, since in it the gods are giant. Dammit, now I won’t be able to rest until I see what it was for myself. I’ll be back later. Gonna fish it out of my DVD collection. Alright, it was some sort of toy amphitheater where the gods would play with the little clay people and thus change their destinies. There’s nothing about this image that implies this, but there’s something godlike about looking down at a city through the window of a kitchen table top, and observing the little people’s lives as they scurry about from place to place. Tosca – I assume this is another performance poster, as Tosca is an opera. Those puppet strings make for great interaction. There are a few other images on the Internet by Rafał Olbiński that show the size difference we like between men and women, if you would like to conduct a search for them. 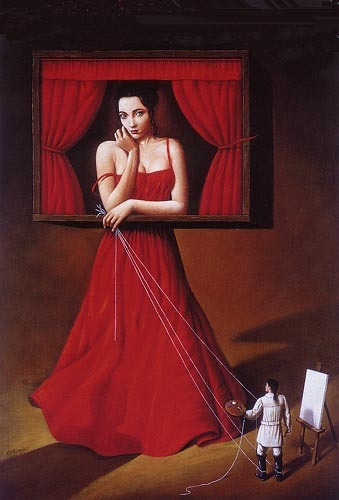 My favorite of the ones above is Tosca, because of the puppet strings. When dealing with size differences like this, I get a thrill if the men are leashed or otherwise restrained in some manner (even when it’s a size difference like in my world). Mip100 on Giantess City makes some really good ones. Tosca has some of the most beautiful music of all time, and the story makes those puppet strings all the more meaningful, in my eyes. It is often the case that women suffer greatly and meet a heart-breaking end in the final act, and while I’ve always been perfectly willing to cry my eyes out when I go to the opera, it’s also fun to see a twist in the order of things as Tosca holds those strings in her hand, and at the other end Mario moves as she allows him. 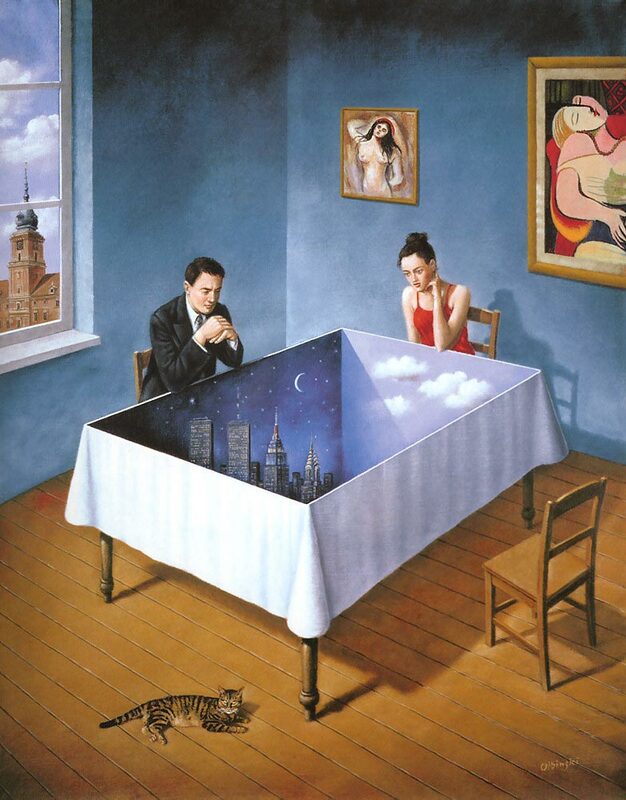 Wonderful illustrations; I’ve seen Olbinski’s drawings in another context but didn’t even think he might be one of us. Oh, but remember Puccini’s Turandot? My, if there ever is an operatic giantess, she would play her to perfection. Oh and thanks for doing all the legwork and tracking all these down, Undersquid! A pleasure to be of service, such as it was. I really only gave Usq. the slightest nudge in supplying the search terms -being of the view that too much direction mars the feeling of making a discovery your own. I hadn’t seen Tosca either but I also really like it. That’s another reason to let people try and find their own way; the result can add to your own experience. I hadn’t heard of Kinuko Y. Craft either. I’m not sure if R.O.’s one of “our people” but there are other examples of his work which may go some way toward bearing out that hypothesis. Your nudges are of excellent quality, Petronius! 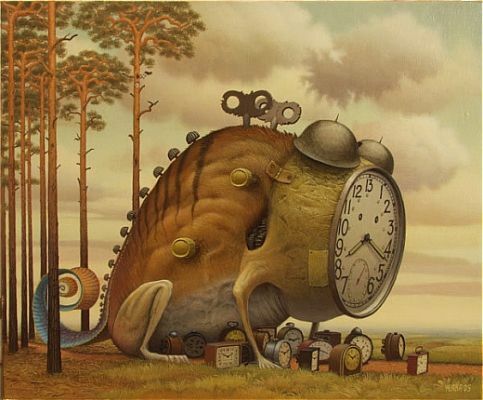 There’s a particular hint of surrealism I’ve found in the paintings of Polish artists that I really like, although in some cases it ceases to be a hint, and it becomes bucketfuls. Beautiful images, all of them. And yes, a real recurring theme there! Hah! That’s a terrific little image. She’s not only manipulating the little guy, but also pointing and laughing at with him in what seems a good natured way. Oh I have that too, to the extent that I avoid saying any words that are even slightly related to these fantasies. I avoid the words, “giant” and “shrunken” and even “squash”! The other week I saw a van with GTS written on it and was worried that I’d gone red and my friends would notice! I try to avoid those “keywords” as well, although there have been several bouts with insanity where I’ve done exactly the opposite, just to gauge a reaction. Played with fire, I have!